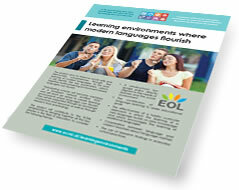 Fostering learning environments where modern languages flourish aims to place languages right at the heart of education policy developments. It seeks through (and for) languages to strengthen the development both of social competences and competences for democratic citizenship. The project is supported by a European network of partner schools, with innovative approaches to establishing language friendly learning environments which promotes the exchange of related resources, research and practice. The EOL project team is delighted to work with all stakeholders in education in order to develop learning environments where modern languages flourish. More than 40 schools are already involved in the EOL project. Now you are a member of the EOL network. Welcome! Use the “plan” as your starting point and a guide to build your “action plan”. Go to the member area, if you want to find more information about EOL partner schools. 3. Familiarize yourself with the matrix: go through the various fields, read the scale, try the questions, etc. Explore the toolbox. Here you will find our forum, the presentations and the synopsis. We would like to inform you that the Companion Volume of the CEFR is now online on the CEFR website www.coe.int/lang-CEFR. It is only available in English for now. The French version will be published during autumn. Especially the mediation descriptors could be of great interest for your EOL project. You might be invited to join our two days network meeting at the ECML in Graz, Austria in March 2018.